Flippin' Excited For Pancake Day! Tomorrow is that wonderful day that is Shrove Tuesday, a day to thoroughly indulge and gorge ourselves on pancakes before the start of Lent. If you've been around a while then you will know that I am a serious pancake girl, as a child my brother and I would wake up every Sunday to the smell of pancakes. This is my mothers tried and very well tested pancake recipe which is simply the best! All you need to do is throw it all into a large jug (get your whisking arm ready) whisk like crazy until you have a smooth batter then pour it into a frying pan on a medium heat, and wait for the bubbles to appear before you flip those babies over. 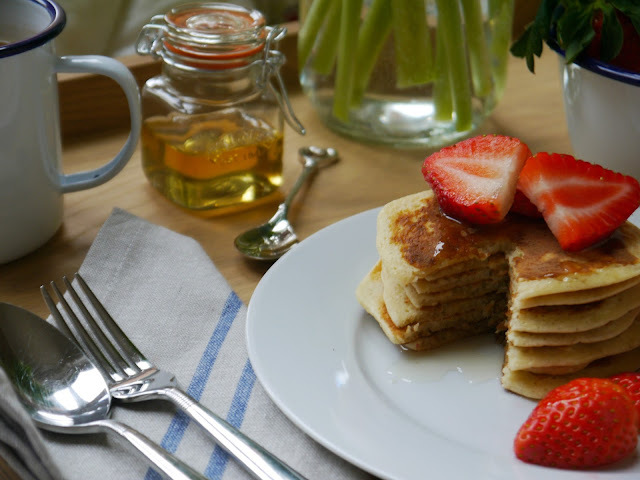 If you're feeling naughty then these are the perfect pancakes for you. However they do have a healthier cousin, the Deliciously Healthy Pancake, so take your pick, are you going all out before Lent or are you keeping to that healthy balanced diet!!! What will you lovelies be putting on your pancakes? I love pancakes! These look like so much fun! Lately I've been in love with cashew butter, and put some on mine with bananas and raspberries!